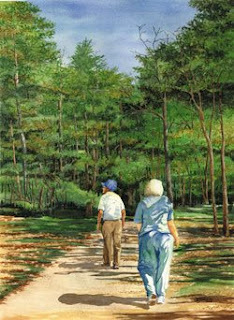 This painting is called, "A Walk in the Park". It is of my parents, in Michigan, taking a walk in the early fall in their hometown of Greenville, Michigan. I thoroughly enjoyed painting the shadows that danced around them. I used lots of Ultramarine blue in this painting for the trees, my dad's hat, my mom's clothing and for the foundation wash on all of the shadows. You can see a a larger image of this piece on my website by clicking here. The painting now resides at my parent's home, who got a big kick out the piece when I gave it to them this summer.